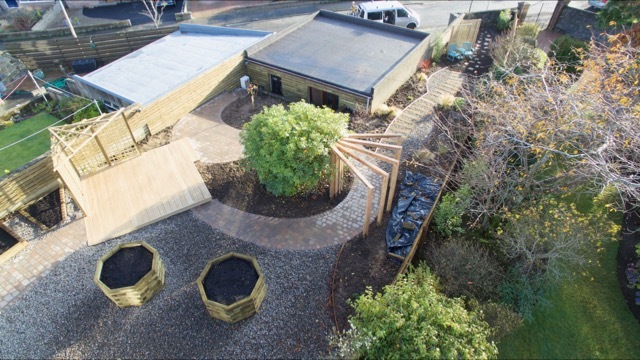 A town garden design project at Craigton Road, Aberdeen. An unusually shaped garden, split in two with a large square area set away from a long rectangular patch adjacent to a sunken garage. The garden was mostly laid in grass with small paved areas and a mature rhododendron in the centre. To add interest to the garden, making it more cohesive and inviting, and less exposed. To create a tranquil garden space to be enjoyed for outdoor living, with seating areas and space for pottering amongst lots of greenery. Papillon designed and constructed a green space that will look great all year long. We made a feature from a much-loved rhododendron in the centre of the garden and created a meandering path that gives the client a journey through their planting. The two previously separated areas are connected but still separated. The curved stone path in the main area adjoins the sleeper path in the secret garden. The wooden sleeper path blends with new wood cladding used on the sunken garage. The garden has plenty of seating for outdoor enjoyment and lots of space for pottering and cut flower growing. It has practical elements built in, with a washing line area and utility area all nicely blended with lush planting (still to be done in springtime). © Copyright Papillon Garden Landscape & Design - all rights reserved.